Of course, Please consider making a donation to your local Honor Flight Network hub to ensure that our Veterans can keep flying in 2018 and beyond! The HFN estimates that it costs about $500 to fly each Veteran to DC for a day (longer trips cost even more!) so please consider helping this wonderful program continue. 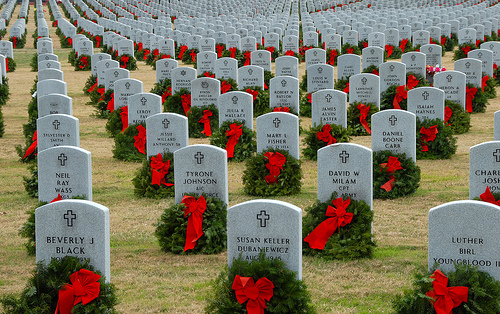 Many of our HFDCA volunteers also help to lay wreaths at Arlington National Cemetery for the Wreaths Across America – Official Page event each year. Each wreath is sponsored by a $15 donation — please consider sponsoring a wreath in Honor or in Memory of your favorite Veteran today. ← the PERFECT holiday gift!